Those. Look. Delicious. They are totally going on this week's menu. And, Cooking Light FTW!!! I've started keeping my issues of CL in the kitchen for easy access. 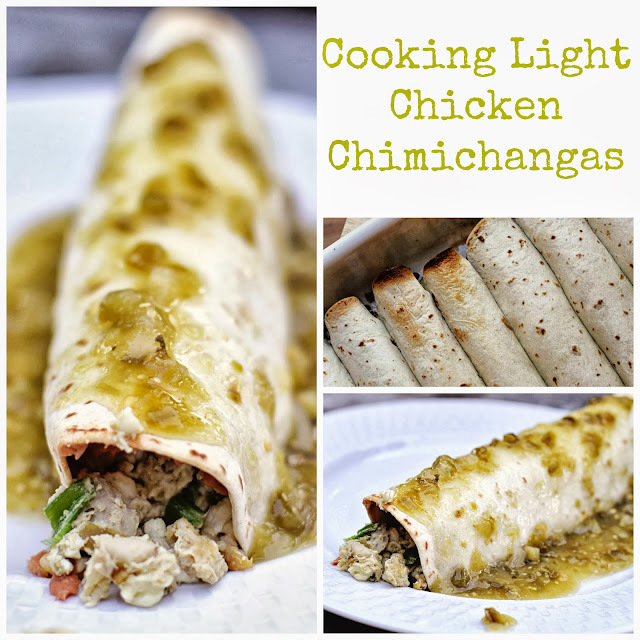 What a great idea to bake a chimichanga instead of fry it. Yum! I will definitely make these - I'd eat mexican food 7 days a week if I could! Thanks for the great recipe! Those do look good! I've made enchiladas before, and while they didn't come out quite right, they were still good, but heavy. These look so light and refreshing! I'm going to have to give them a try. I want to face plant into the bowl of guacamole...oh yum! Those look delish! Now, I'm hungry again! Oh my goodness! These look delicious! My husband will especially love, thanks for the recipe! What a delicious food is here and i am sure everyone will like these roles because it is healthy also. I will try to make this chicken role because i am free nowadays from my pay for an essay work and hope i can make it well.